Spasms of Accommodation: Is FedEx rural-phobic? I live in the country. My address is a US Highway. I buy things online. Computers, socks, hats, lawnmower belts and blades. The UPS man recognized my last name and said he was sorry when my dad closed his company. He tells me gossip about my neighbors who also can't get jobs and are home all the time. He's like a part of the community, even though I am definitely not. I have no idea who he was talking about that's moving to North Dakota to be a bricklayer. The UPS deliveries come from my county seat. The driver comes to my gate, opens it, brings me stuff, and closes it behind him. But FedEx comes from across the state line near a small airport that takes FedEx planes. My house is about the same number of miles from both places, but for some reason FedEx freaks out when they leave the big city. Big being a population around 175,000. Compare to where my UPS deliveries come from, population around 9,000. 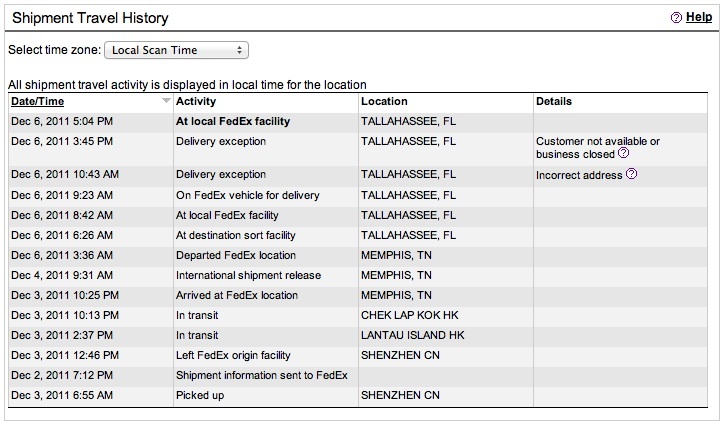 Guess what I ordered from Shenzhen? Yep, a new video camera! It is cleverly disguised as a cell phone and is therefore subsidized by AT&T with the tower at the end of my driveway, so I've got that going for me. Apparently I can't have my new toy though. 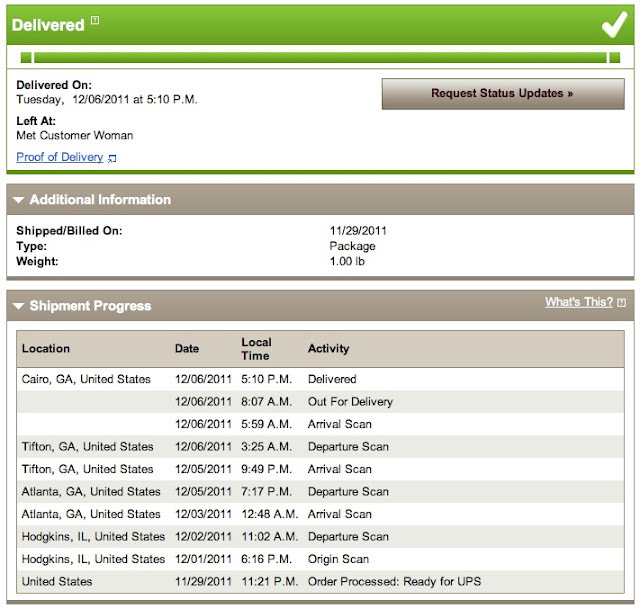 FedEx thinks I'm alternately lying about my address or they are looking for me where I am not. I have PROOF I was here this afternoon. "Met Customer Woman." Can't be more plain than that. UPS can do it, what's wrong with FedEx? I want my new toy! I want Siri to tell me all about Chek Lap Kok! I suppose it's in Hong Kong? That sounds AWESOME! I wonder why there's no way to put in instructions for how to find my house on the FedEx website? I can see that they don't know where it is. They don't bother to call the phone number that's printed right on the label. So why not let me put in the coordinates? Wouldn't latitude and longitude help? Mailbox addresses are so antiquated. They're relics like land line phones and over-the-air TV. We need something better. A nice QR code for the coordinates perhaps. I can copy and paste it. I'm sure Google can put it in the Chrome autofill. Nobody around here can figure out where my mailbox is. (The mailman doesn't believe I actually live here. The first time he drove down the driveway to bring me something that wouldn't fit in the box he asked me if I'm some kind of book editor. I told him I am. He thinks this is just my office. So small.) The voter registration people even put me in the wrong county. The computer tells them my address is 12 miles north of here in the next county. It would be so simple if I could just tell people the latitude and longitude in decimal degrees, or upload a cell phone picture of my house with location turned on. Instead they told me to go to the Secretary of State website, fill out a form, print it, and mail it to the county seat. Isn't that adorable? Now it might not be that Fed-Ex is rural phobic. They might just be incompetent. I followed a saga on Twitter recently where Amy Berg's new Macbook Air was delivered to the wrong address. (She's a TV writer) She convinced Apple she didn't have it and they sent another one, again, delivered to the wrong place in LA. I guess there was a Customer Woman to sign for it so she just took somebody else's package. (Chek Lap Kok!) Amy did finally get her computer after about 2 weeks. I think all this is a problem technology can solve. I am available as a consultant, FedEx. Call me! You have my number. It's right there on the box. Wonder what they do for a hobby in the summer? There is no such thing as Girls' Science! Of course we believe in evolution!